The print object observation is of zines that are exhibited at the University of Delaware Morris Library's First Floor Exhibitions. The exhibit’s content presents the zine’s social, cultural, and political interactions from the late 20th Century to the transition of its form in present day. This content of the exhibit, Zines! Self-Publishing Youth Culture, Then and Now, is displayed with two types of book forms: the zines and the traditional form of published books. Zines are a form of self-publication, which are created and printed cheaply usually from a copier machine. A zine is a printed object that documents and is used as a forum for distributing various aspects of sub cultures. Zines tended to be most widely distributed in the 1970’s through the late 1990’s. In the exhibit, use of the zines during these specific decades is presented with publications that examine the artistic medium such as Stephen Duncombe’s Notes from the Underground: Zines and the Politics of Alternative Culture and Liz Farrely’s Zines. The highlighted social, cultural, and political aspects of one type of sub culture that employed the zine as a forum of self-express is from the 1990’s Riot Grrrl movement. The Riot Grrrl movement was out of frustration with the mainstream perception that women held positions of marginal importance in subcultures, for example, the punk music culture. Young women embraced various forms of creativity and activism strategies to publish work based on their own life experiences. Zines became a form of printed communication for this movement, which offered women control over publishing content and distribution that wasn’t relying on mainstream media. Two examples of zines, No Snow Here and Figure 8, from this Riot Grrrl movement are on display. The “now” element in the title of the Zines! exhibition focuses on the transition from print media to social media as a forum of self-expression for sub cultures. Today zines are still being published, but the Do-It-Yourself (DIY) aesthetics from the culture of zines are influencing the internet-based Indie Industry. These cyberspace publications of self-expression are also presented in the exhibit with publications, such as Kaya Oakes’ Slanted and Enchanted: The Evolution of Indie Culture. The exhibit, Zines! Self-Publishing Youth Culture, Then and Now, offers several concepts of how the zine has offered a print media forum for sub cultures as well as the transition in print media culture. The tally for the July Expiration Group of the Coupon Collection is 1229. To view each segments tallies visit the Coupon Collection page of the website. The restaging of the Coupon Collection is on display at the Newark Free Library till August 17, 2012. If summer travels are in the proximity of Newark, Delaware USA - please inquire about the library’s hours and location. To view more images of the Newark Free Library restaging of the Coupon Collection please visit the website. Remember there are several social media options that are available on the front page of the website to stay updated on the recent addition of the collections and public access to the collections via the internet. 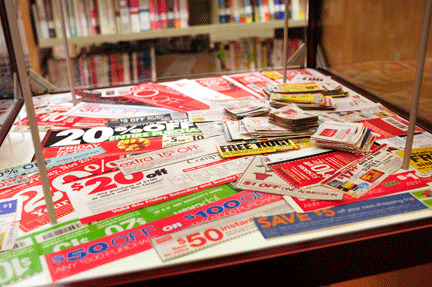 Image is of the bottom shelf displaying the November 2011 Expiration Group of the Coupon Collection.